Inventory We are a resale marketplace, not a box office or venue. Ticket prices may exceed face value. This site is not owned by American Bank Center . The American Bank Center is an event arena that has a split-tiered seating system. 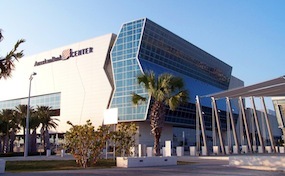 The American Bank Center serves host to many meetings and conventions, trade shows and exhibitions, live performances, and sporting events and is home to the Corpus Christi IceRays Tier II Jr. A ice hockey team, the Corpus Christi Hammerheads Indoor Football Team, and the Texas A&M University-Corpus Christi Islanders Men's and Women's NCAA Basketball teams. The American Bank Center is owned by the city of Corpus Christi, Texas and managed by SMG. The in-house catering company is Centerplate, a company that offers special event consulting and custom catering for food and beverage requirements. The American Bank Center has hosted many events including, WWE, Circus, Disney On Ice and more. CenterCorpusChristi.com is not affiliated with any primary box office or supplier. We are a privately owned and operated business specializing in sales in the secondary market. Prices are often above face value and tend to change quickly with demand. To buy tickets for any American Bank Center events in Corpus Christi simply click on the event of interest or call our operators at anytime.